Gone are the days when anglers would go about with their big clunky chunky tackle boxes. 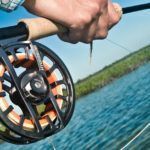 Increasingly you see the new breed of anglers opting for compact tackle boxes or even more handy backpack. 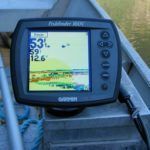 Yes, you read it right; modern anglers are no longer interested in those huge boxes that also result in a lot of wasted space. The focus is more on convenience and purpose. 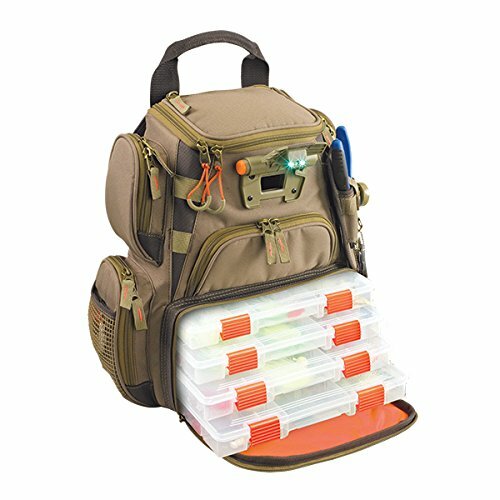 These fishing backpacks are so designed that they can hold all your tools, tackle and gear and lets you move ahead with everything quite conveniently. Be it rocky terrain or muddy patches; you are quite comfortable with these backpacks. The fact that your hands are free is a major plus. 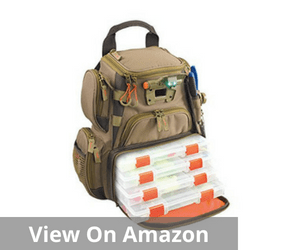 But as you go ahead looking for the best fishing backpack, you must remember that the fishing backpack is a fairly new addition to the overall fishing gear. These are particularly convenient for those opting for bank fishing. It can be anywhere, ponds, streams or river, but the backpack gave them relatively more freedom to walk unaided and look for a catch in their favorite fishing hole. But even otherwise, backpacks were very convenient for other fishermen too. It made the whole exercise of carrying fishing gear a lot more practical and simple. It improved their efficiency, offered them the better scope and also adequate opportunity to target a higher strike rate. However, choosing the best fishing backpack isn’t that simple. Here again, there is a problem of plenty and severe need to differentiate between quality products and mediocre options. You have to take into consideration a variety of factors and also look at how they match your budget. 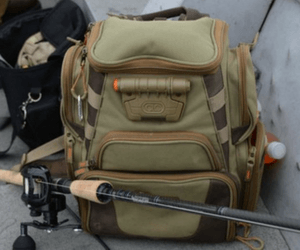 In case all of that is too overwhelming for you, you can simply refer to this convenient list of top backpacks for fishing and take your pick. When you are looking for the best fishing backpack, the Blisswill Outdoor Backpack is a waterproof, easy to clean and an environmental-friendly non-toxic backpack. This product is also abrasion and corrosion resistant. It is a leak-proof alternative and can be carried over long distance quite easily. Overall, this bag is a moderately sized one and has adequate storage space for a small to medium sized trips. 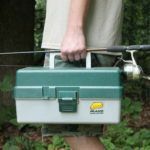 It easily accommodates the lures, pliers, pole, fishing boxes, wallet, keys and all other accessories. This can also accommodate the fishing rod at the bottom of the bag. Moreover, the bag is high on comfort and has an adjustable shoulder strap to adjust as per your height and weight. So whether you are tall or short, this bag will not disappoint in terms of either height or comfort. The design of the fishing rods belt deserves special mention. 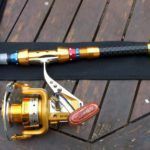 It can be easily fixed as per the rod, and that makes the overall set up a lot more convenient. 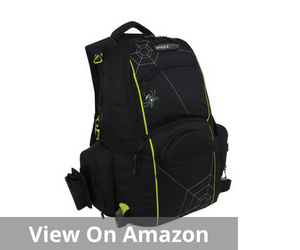 This is one of the biggest advantages of this backpack made by the world’s largest fishing tackle production company. But one of the biggest advantages of this backpack is the pricing advantage that it offers to its customers. They also devoted a significant amount of time and energy to better the overall experience for its clients. The design is continuously adapted to suit user convenience and address the practicality of build. The effort is to create a winning solution that is both versatile, multi-functional and practical. 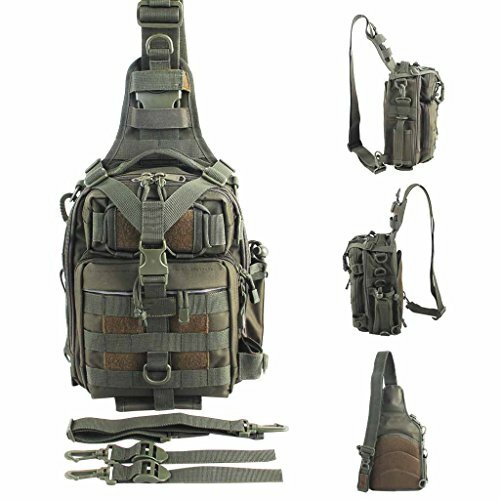 The durability of the backpack also needs special mention. This is made of top grade 1000D water-resistant nylon fabrics. They are also stitched in a secure format to offer maximum possible protection. The full-length double zipper also offers additional security to the users. This is also an environmental-friendly product. It is made of non-toxic material and does not result in any severe emission. 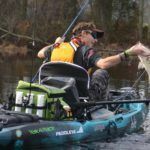 When you are looking for the best fishing backpack, this Wild River Nomad backpack is practically one solution that fits all specifications. 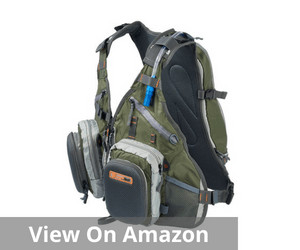 It is a practical and multi-functional backpack that can accommodate a large number of fishing gears in one go. But the LED light system in the backpack is one of the most attractive features of this backpack. 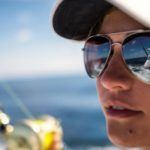 This is one feature that makes fishing a reality at any time of the day. You are no longer constrained by the daylight element. This integrated LED system allows you to see within your bag and around the key operational area with relative ease. 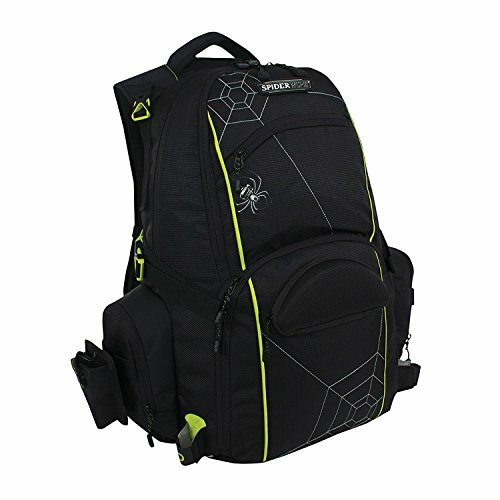 This backpack also has a dependable upper storage area which is reasonably large and adjustable. It also comes equipped with a removable divider that can alter the storage alternatives and you can also convert this into a full-sized backpack, especially if you have large items to store. This backpack can easily store six medium number 3600 and four number 3500 trays. 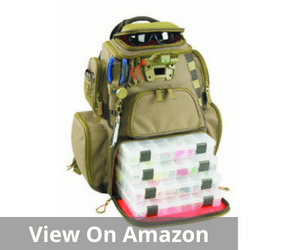 It will not be wrong to say that this is the type of backpack that is every angler’s dream. Apart from these standard features, this backpack also has a removable pliers holder. This makes it easy to locate them whenever you need. The mesh pockets both on the external side and inside the backpack make it possible to see the contents quite easily. This backpack also has base pads that help to reduce the daily wear and tear and adjustable shoulder strap. It also works very well in keeping the bag dry and relatively clean. The permanently molded sunglass holder is another welcome feature in this backpack. 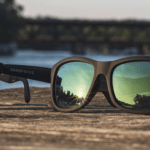 Now you don’t run the risk of damaging your glasses while on the go. The front pocket cover of this backpack folds down quite easily. As a result, this creates a handy work surface that you can utilize in case of space crunch. The protective rain cover along with this backpack makes it a convenient option in any type of season and any place. Mesh pockets help in locating gears rather simply. The Custom Leathercraft Wild River backpack is one of the best fishing backpacks that you can buy for storing your fishing gear on a trip. 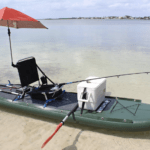 This one also comes equipped with a LED light system that enables fishing at all hours. There is no more time constraint for you. 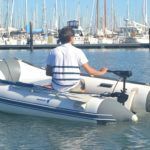 You can now fish anytime from dawn to dusk. This is also an extremely well-organized backpack. The mesh pockets help you to segregate the various elements and store them in a well-structured manner. The mesh also enables you to spot these items easily. So now you don’t run the risk of losing your mobile or getting your licenses wet. They remain intact and top shape. The weatherproof feature ensures that all your gears remain proper even if there is sudden rain or snow. In terms of storage too, this bag is quite adequate. You can store up to 4 3500 style trays or 2 3600 style trays. This means that you have enough place to store everything that you need to ensure that you have a great trip. The removable plier holder also adds to the comfort element. It gives you easy access to your tools. Padded shoulder straps to enhance the comfort factor to a large extent. Overall, a comprehensive package with excellent storage space. Most users are particularly happy about the balance of the various features that this product encompasses. Customer convenience addressed at every step. Be it the mesh pockets or the removable plier holders; it is primarily about addressing every type of user need comprehensively. 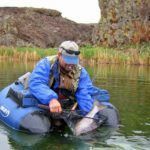 If you ask me, this is undeniably one of the best fishing backpacks not just for the host of features that it encompasses but also the fact that this backpack comes with a lifetime guarantee. Handy, practical and comfortable, the Spiderwire Fishing Backpack is perfect for all those who have to trek to their favorite angling spot. This backpack is high on convenience, ease of use and adequate storage. The top compartment of this backpack is great for storing personal stuff, and you can keep the food and drinks in the middle compartment where it is relatively cooler. The utility boxes are meant to be stored in the lower compartment where you can easily reach for the gears when they are in full action. The side zipper pockets and a fishing tool holder ensure that handling your gear is never a problem. The pack sits upright, and every compartment is within reach at any possible time, whether you are trekking or angling. Most importantly it keeps your gear sorted in all possible way without running the risk of losing them or mishandling them while in a rush. But the lifetime guarantee that comes with the product is the icing on the cake and makes it an extremely lucrative buy. 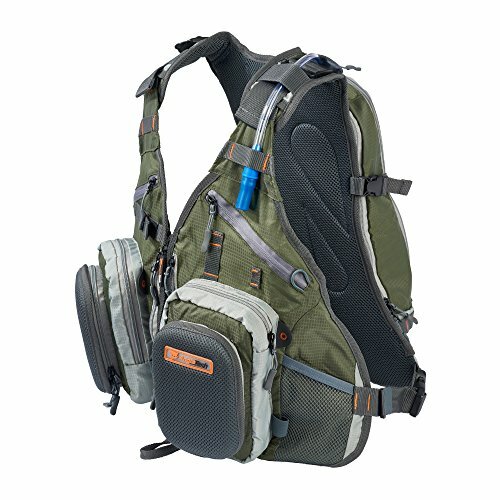 One of the best features of this fishing backpack is the water bladder. Of course, you can carry crates of drinking water with you if needed, but that will always be bulky and uncomfortable. 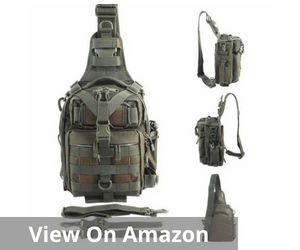 However, with this backpack, that concern is taken care of to a large extent, and the overall set of features also matches the provisions of most backpacks available at this price. The water bladder will help you remain hydrated at all times and also makes carrying water a lot more comfortable and convenient. The in-built water bladder is about 1.5 liters and often this is adequate to address an individual’s drinking needs for the entire day. This cuts out the added stress of carrying more luggage. 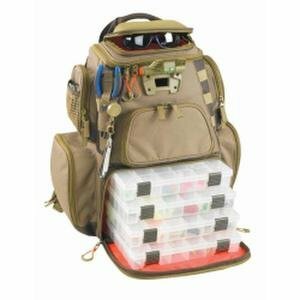 You can consider this as one of the best fishing backpacks also because of the amount of storage space that is available in this bag. This helps you to keep all your equipment and gear in proper shape as well as properly organized. This bag is also high on individual comfort. Whether you consider the ease of carrying it or the ease if using it, this is one of those backpacks that will not disappoint you on either front in any way. It is all about meaningful and well-strategized space saving initiatives. Therefore, it is quite apparent to you that the best fishing backpack comprises many factors that have to be balanced properly. It is not just about storing all your stuff together but also about the fact that they need to be organized efficiently. It is primarily about creating sufficient storage space without compromising the comfort or the convenience factor. That is what the major challenge becomes when you are looking out for a great quality fishing backpack. There are many small factors that you must take into account ensuring a value buy. This is the primary factor that you must look into. The best fishing backpack is the one that always has room for all your gear. So carefully assess all the gear that you need to carry and then match it with the specifications of the backpacks that are available. That will help you get the best possible combination. When you are on a fishing trip, the fishing tray storage space is a crucial consideration. Most good quality and popular backpacks have large and well-allocated compartments that can store anywhere between 2-4 boxes. That also helps you to reach out to them quickly as and when you need to use these boxes. The durability of the backpack can be determined in two ways, firstly the material used and also the quality of the stitching. Carefully consider both these factors before you decide on a backpack. 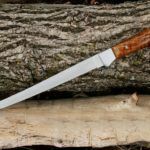 Even if costs a little more than the rest, the durability element makes it worth the effort. 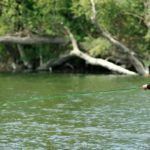 Therefore, the best fishing backpack is undeniably the ones that can suitably address all your need and balance your comfort as well. When you are out looking for one, do not just base your choice on cost or superficial features alone. Make sure that the fundamental factors are all there. That is what makes your backpack functional and a value for money proposition.